Spain Park junior Sarah Ashlee Barker is this year’s Over the Mountain Girls Basketball Player of the Year as voted on by OTM area coaches. 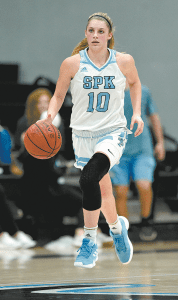 Sarah Ashlee Barker has been a force to be reckoned with her entire career at Spain Park. This year, she averaged 20.2 points per game and 9.5 rebounds per game as she led the Jaguars to the regional finals before falling to Hewitt-Trussville. She has already committed to play college basketball at Georgia. She’s still just a junior, and she’s this year’s Over the Mountain Girls Basketball Player of the Year. While her team was unable to repeat as state champions, there were encouraging moments that Barker believes the Jags can build on when the squad return for the 2019-20 season. There was some youth on this squad, but Barker is confident that this year’s experiences will help them as they aim to return to state. Barker points to Avery Madson as a teammate she believes will return and become a bigger scoring threat. She also believes that Camille Chase gained a lot of confidence down the stretch and will be able to make big contributions as a sophomore. Spain Park and this year’s state champions, Hoover, have built impressive girls basketball dynasties in recent years. As the Jaguars look to rebound and reclaim their throne, there will be no shortage of motivation for their leader. She’ll also strive to make this season’s graduating seniors, Ahrielle Parks and Bailey Bowers, proud. Members of the 2018-19 All-Over the Mountain Girls Basketball Team, front, from left: Ahrielle Parks, Spain Park; Bailey Bowers, Spain Park; Skyla Knight, Hoover; Miya Kimber, Hoover; and Emily Henderson, Mountain Brook. Back: Sarah Ashlee Barker, Spain Park; Hannah Edwards, Oak Mountain; Joiya Maddox, Hoover; Kailey Rory, Oak Mountain; and Coach of the Year, Krystle Johnson, Hoover. Not pictured: Ann Vandevelde, Mountain Brook; Emma Smith, Vestavia; and Zoe Watts, Homewood. Journal photo by Maury Wald.